Not all leveled up as I don't see any use in many of them such as Ugnaught. I guess the second part of your question is about the time investment of gearing up a char to G11/12 compared to the time it takes to get him to 7*. Getting a char to 7* takes way more time in general than gearing up. getting all characters to 7* lvl85 is impossible for f2p players since some aren't even farmable yet. I'm sure there are players who've got them all unlocked and lvl 85 though, with enough credits to spare to star them up, waiting for them to become farmable. My second question is if by no longer focusing on stars if it makes getting gear appear to go faster since you are only focusing on gear. And I am just curious if anyone out there has accomplished it. Im missing 7star c3po, only have him at 5star. Thats the only thing missing. Other than that, my bottleneck is carbs/stunguns. Theyre very limited and it often means that despite having all meta teams (traya, cls, jkr, ns), i must make a decision which one to gear up properly to g12+, the others are awaiting theur turn around g10. Congrats, do you have lot of credits lying around now and how about crystals? Since I am asking for info felt I should share mine. Do you find that you have a lot of credits available? I decided that since I made the mistake of leveling up my characters a long time ago that I would just level everybody up. Only have 14 characters left under level 85 and 5 characters left to unlock. If you want to progress as fast as possible, you definately shouldn't try to get all characters 7* and lvl85. It's far more beneficial to focus only on good characters, characters that are (potentially) required to get good characters and mods, that way you can perform better in every game mode, thus earn more rewards, thus progress faster. I completely agree, but at this point the damage is done unfortunately. Yeah, I know. That really hurts you in grand arena, doesn't it? It does on a 50/50 basis. 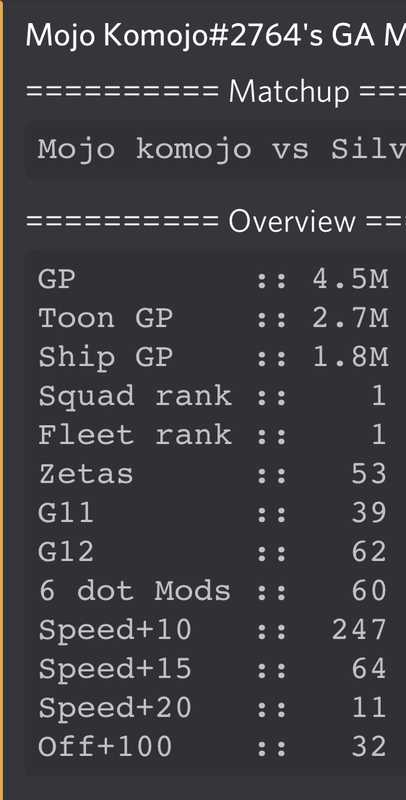 I’ve played since launch and have a 3.3 mill gp almost and have Revan/traya. 100% F2P, no money spent whatsoever and this is totally achievable. I’ve got around 15 20 speed mods and am pvp oriented. Mods are everything though. Bad mods mean you can’t be competitive in all modes. I doubt it would be possible simply because toons keep coming out. i.e. very few will have the 2 OR that's not on the tables finished if they are f2p. 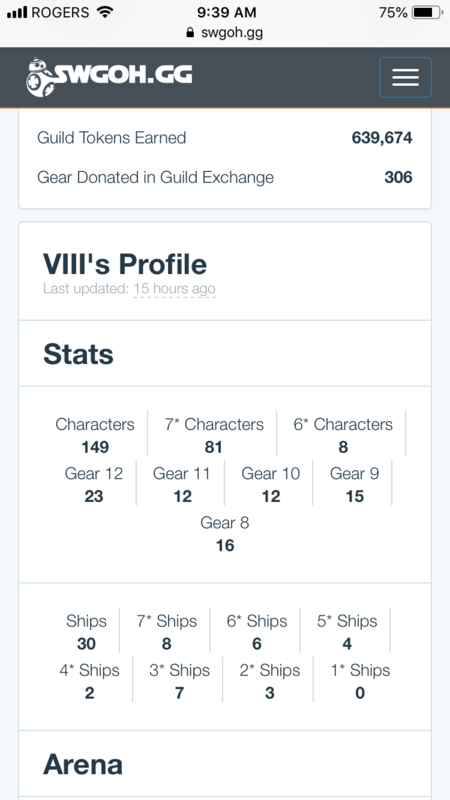 This is where I'm at but bear in mind I don't level/gear/star character anymore because of GA matchmaking. And the other one is our leader who makes a point of "getting rid of the shard collecting"
Upto the start of GA I have everything leveled, geared to 7-8, all abilities leveled and everything modded. 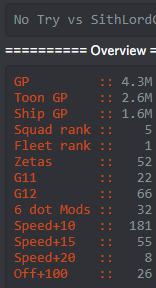 I'm nearly there just hit 4.5mGP F2P, 158 7 star characters (1 more today not updated yet on swgoh.gg). Everyone is level 85,as long as you have enough good teams for defense and offence and a good strategy, there isn't that much difference facing opponents at 4.5 as opposed to 4mGP. As No_Try said there are quite a few in that range, I know of a number of others around the same GP level. 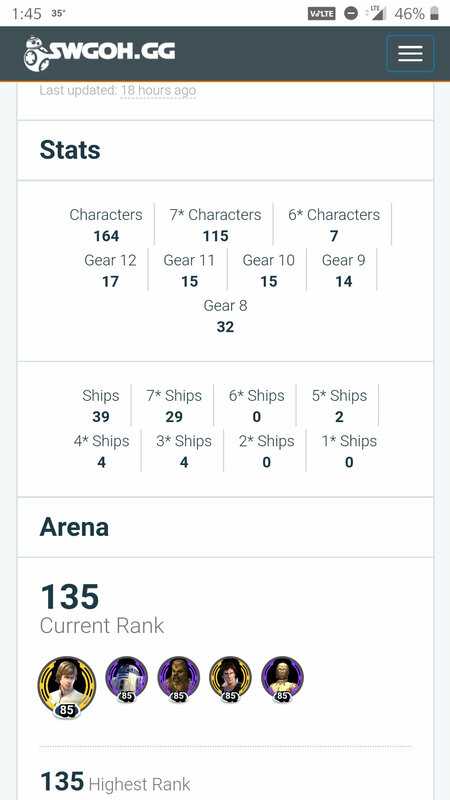 Started not long after launch, ranking 1st in both arena's makes a big difference to progress and crystal income (ignore fleet on my swgoh.gg profile for some reason the recording time went off a few weeks ago). Whoops sorry, didn't mean to make that picture so big. Some people have just planned really well since the beginning. It’s most certainly possible.